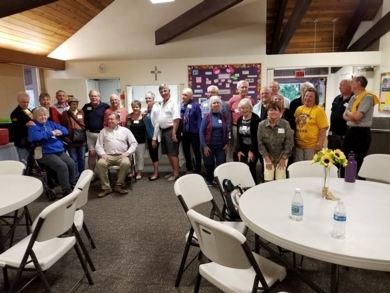 We had about 50 attendees for the 55th Reunion and we feel everyone had a good time. There was plenty of time and space for visiting and lots of conversations flowing around the room. Pizza from Romeos was delicious, caesar salad aplenty and more than enough wine, beer and water to satisfy this crowd! We remembered to take a group photo just before the event was over (we were enjoying the party) so this photo includes only about half of the attendees. Please click on the link below to see more photos. Mary Bruce Haunreiter provided a door prize -- a photo album she created from the wonderful photos of the 50th Reunion taken by her photographer son, Kurt. The Memory Book was won by a very pleased Doug Aardahl. Thanks to Donna Johnstone Hoffman for getting St Albans for us, Karen Purton Wuerch for continuing to monitor expenses and keep us solvent, Jeanne Smart Peterson making sure that beverages were provided and Bev Palmer Black for salad fixings and all the great memorabilia that she was able to get from the school district -- Benny Bengal outfit, school banner, basketball uniform. 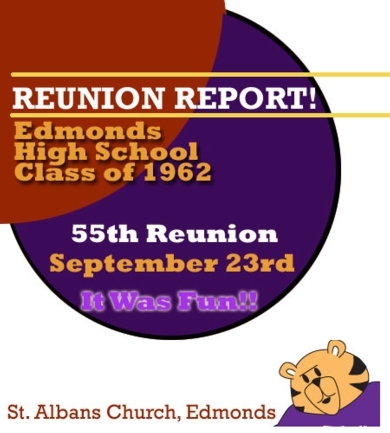 And Bev also was in touch with a parent booster group who brought Edmonds Tiger Tshirts--a very popular item. Also some Edmonds Woodway shirts. If you want an Edmonds Tiger Shirt (yellow with purple design), contact Emily, a member of the booster group, at 425-345-6204. The profiles on this site are readable only by classmates unless you wish them to be public. 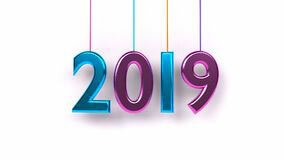 On your profile page, you can select an option to keep your information only for 1962 Classmates, all EHS alumni or public. This option is available at any time by using the "Edit Profile" link in the left column, and then selecting "Edit" at the top of your Profile page.